Providing individual services to residents is a specialty of our practitioners. Over many years, we have assisted hundreds of aged and transitional care residents with needs relating to malnutrition, Diabetes - Type 1 & Type 2, healthy eating, osteoporosis and many more. Recommendations are delivered using best-practice guidelines and all consultations come with comprehensive written reports which are delivered to the facility, and the resident’s GP, within two business days. Where appropriate, liaison is provided with the residents family, Clinical Nurse Consultant or support workers. supplements combined with relevant meal plans. In-service training for nursing and catering staff are an excellent way to ensure team members are up-to-date with the latest information on dietetics for aged care. Education can be provided individually for new staff members however facilities benefit greatly from a group consultation format where our dietitians can attend the facility and discuss one, or a number of conditions. Group ‘in-services’ are delivered in a professional, fun and interactive way, ensuring that each staff member gets the most from their training. To aid in the educational process, numerous resources are provided for ongoing reference. Many other topics can also be covered and adjusted accordingly to suit your needs and requirements. Our Dietitians can provide menu reviews and assessments which include a comprehensive written report with recommendations on how to improve the menu to meet best-practice guidelines and the 2.10 Nutrition & Hydration Accreditation Standards. During the consultation process we work closely with the appropriate catering staff and Director of Nursing to ensure that these suggestions are provided in conjunction with the needs of the residents and your facility’s needs, resources and budget. Do you have accreditation approaching? Our staff can assist you with ensuring your facility is prepared and ready to meet all relevant Accreditation Standards. 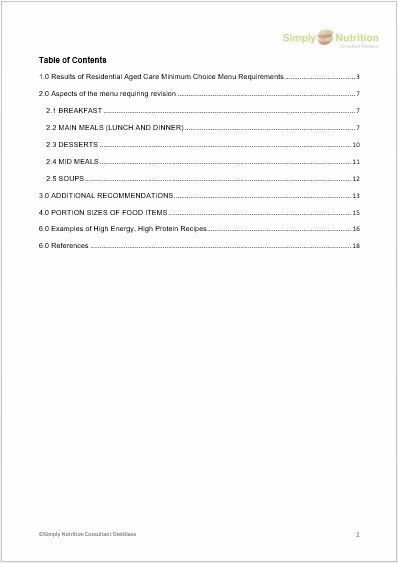 Individual residents and your kitchen menu can be reviewed in a timely manner, complete with assessments and recommendations. Uncertain as to what your facility needs? One-on-one meetings with your Director of Nursing and Head of Catering. Assessment of staff’s current nutrition and hydration knowledge. 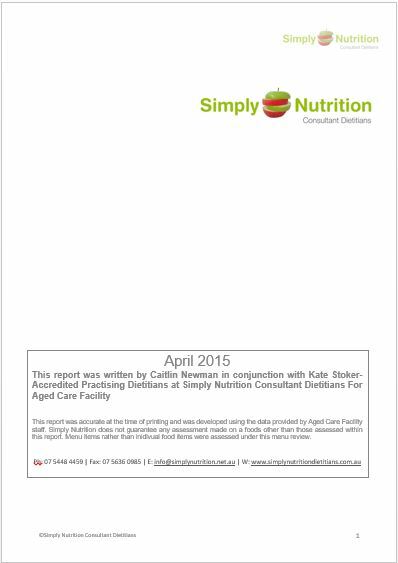 Audit of existing nutrition documentation. 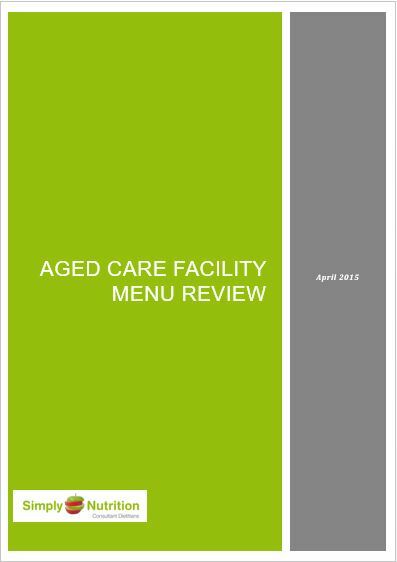 ​Keep team members up to date with the latest information on dietetics for aged care. Services provided individually or via group presentations.